Will you be open all year long? Yes! We close down annually for approximately 10 days over the student winter break to allow our staff time off with their families. We also close down in observance of other major holidays throughout the year, but never for more than an extra day or two. YES! Make sure to check out our catering page for more information. Our summer season fills up quickly with weddings and other large events, so make sure to contact us ASAP for date availability. You bet! We believe in keeping money local, so we get as much as possible from local sources! We get meat from C&L Meat Locker Co. in Moscow, Todd from Ladybug Creations in Moscow bakes us our delicious sandwich and side rolls, and Lacey-K Tree Service from Troy delivers the majority of our wood. A big thanks to our suppliers for helping us keep the BBQ smokin’ daily! Do you have beer on draft? Yes! We have 10 beers on draft and a small selection of Tallboy cans (Coors Light, Rainier, and Pabst). Pabst is on year ’round and our remaining 9 taps are a rotating selection of craft beers from breweries such as Ballast Point Brewery and Spirits, Bale Breaker Brewing Co., Stone Brewing Co., Deschutes Brewery, Alaskan, Sierra Nevada Brewing and many more. We have a rotating nitro tap and also carry a gluten free cider at all times! Check out our beer list for what is on tap now! Why did you run out of food? When preparing for a day at CD’s, we have to predict how busy we will be and how much of each meat we will sell. We try to estimate the best quantity to cook to avoid waste and to keep from selling out early. Weekends on the Palouse can get pretty busy and sometimes we just can’t keep up with all of our fans! We cook as much as we can, but once it’s gone – it’s gone for hours. We can’t predict the future or exactly how busy we will be (though it would make the job much easier) and thankfully, we are pretty good at guessing. We know it can be disappointing to find out we’ve sold out, but it’s the price we all pay for truly authentic, fresh, smokin’ good BBQ! Why can’t you just cook up something quick? 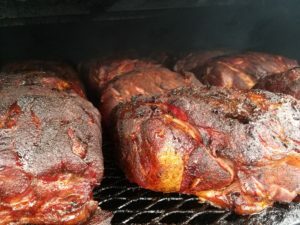 All of our meat takes hours to smoke – that’s why they taste so delicious! We’re always cooking, but have to keep it low and slow. As much as we’d like to cook something up for you, we can’t have anything ready in minutes. It really does take hours to replenish our tasty BBQ supply! How long does it take to cook the meat? Cook times vary based on the type of meat. 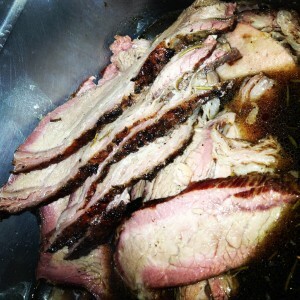 Chicken and spare ribs typically take about 5-6 hours, beef brisket takes 12-14 hours depending on the size of the cut and our pork shoulder cooks in about 10 hours. Our sausage links and savory bacon take around an hour until they are ready for serving. Are you sure this meat is cooked thoroughly? You’ve probably noticed a pink ring on the outside of certain meat. In the world of barbecue that ring is a wonderful thing! In fact, it is highly sought after in barbecued meats. 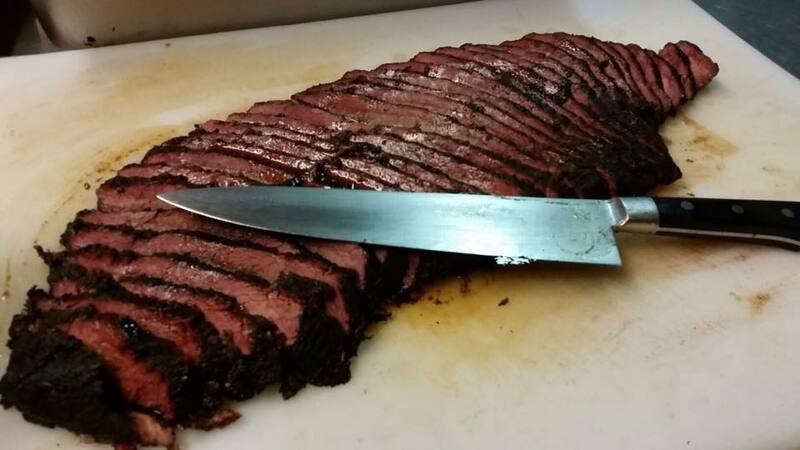 The “smoke ring” appears after meat has been properly smoked low and slow and the actual cause is a chemical reaction between the meat and smoke. Do you burn with wood, charcoal or propane? Here at CD’s, we use real pieces of hardwood to smoke the meat! 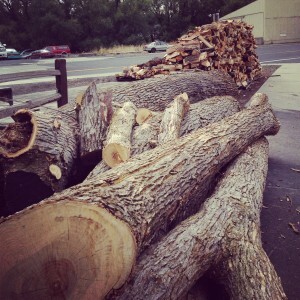 Our wood is delivered in large pieces and we hand cut and process all of it! 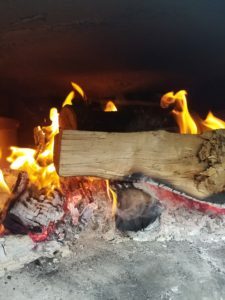 In the winter we supplement our wood with lump charcoal for heat; however, the main cooking source (and flavor) comes from locally cut hardwood. What type of wood do you burn? We have a rotating supply of quality hardwood delivered to us, so the type can vary by the week. Typically we burn with Maple, Birch, Locust, Oak or any fruit wood. We really like to mix and match the different wood we have on hand to create a truly unique taste. 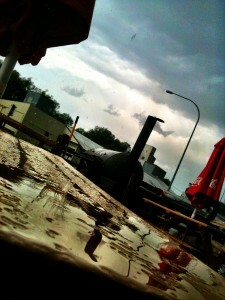 How does the weather affect your cooking? The more rain, snow or wind – the harder it can be to cook outside. 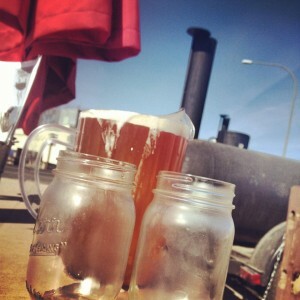 When the weather cooperates, we get our meat cooked on schedule and right onto your plate! However, Mother Nature doesn’t always like to help us out. When the wind blows the wrong direction or it is extra cold outside, it can take longer than our target times for meat to cook. We try to compensate for the poor weather, but can’t always predict a summer storm or the winter wind. Do you really serve Penny Pitchers on Vandal home games? Yes we do — until 2:00 or the kegs blow! If you’re 21 or older, can handle a wall-to-wall crowd & are willing to be responsibly Nasty and Inebriated, this is the special for you! 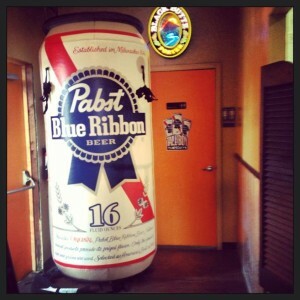 We gather up a few kegs of Pabst and open up at 10:00 am to serve our delicious breakfast sandwiches until they are gone. We don’t have many strict rules around The Smoke Pit; however, you must buy food if you want to drink for $0.01 — even if you’re sharing a pitcher among friends or keeping it to yourself.